This month I wrapped up my first online summit – Raise Your Visibility. 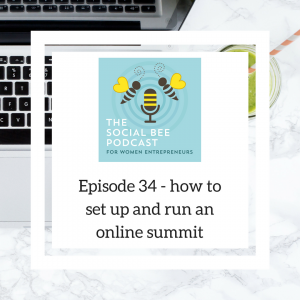 This podcast explains how and why I decided to run an online summit, how I got my speakers on board, sorted out all the tech, and launched a full three-day summit. If you would like to access all the training you can do by joining the Social Bee Academy where the content will be drip fed out over the next eight weeks. Or jump straight to it with the all-access pass here.